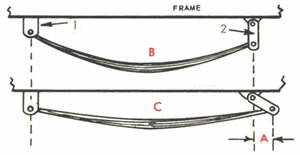 Most rear axles in classic cars were suspended by semi-elliptical leaf springs. These components consist of a number of flat steel springs of varying lengths, bolted together in the center to prevent longitudinal movement. On each side of the car the front end of the spring is fastened to the frame by a bolt that goes through either a rubber, or lubricated bronze, bushing. At the rear end is a shackle that is also bushed and can move longitudinally to keep the rear axle moving up and down in the same plane (more about these below). The rear axle assembly is bolted to the leaf springs by "U" bolts to form a rigid mount for the suspension, and usually is fitted with a shock absorber mount as well. Partial view of semi-elliptical leaf spring. Center bolt serves to keep leaves in line and properly spaced. Why not a one leaf spring? There are vehicles that have been suspended by a one-leaf spring, but this configuration has its problems. Springs have a natural resonance frequency, wherein they will keep oscillating for a while. Having multiple leafs of different lengths creates the effect of canceling out each other's resonance. It also allows an overall shorter length for the spring assembly. With multiple springs, however, the leaves slide against each other as the spring rebounds. To prevent squeaks and undue wear there are rubber or vinyl inserts between the leaves, on which they slide. Older leaf springs were encased in sheet metal, leather or canvas, and the entire assembly was filled with grease. Flexing causes a variation in spring length. 1-Stationary spring hanger. 2-Hinge type shackle. In B, normal load may produce this spring shape. In C, spring has been compressed. End 1 has merely pivoted but end 2 has moved out as spring lengthens. Difference in length is shown at A. There are metal bands wrapped around the springs in several places. These are called "rebound clips" and are there to prevent the leaves from separating when the spring rebounds upward. 1) Rubber bushed shackles use a rubber bushing between the spring eye and the springs eye bolt. The spring and bolts do not touch and the pivoting motion is absorbed by the flexible rubber. Rubber bushed shackles need no lubrication, but their disadvantage is that they offer relatively little resistance to side motion. 2) Threaded shackles utilize a U-shaped bolt that is threaded full length. The bolt is inserted through the spring eye and the hangar. A steel bushing, threaded inside and out, is started on the bolts and then screwed in until it bottoms. Grease is inserted through a fitting to limit wear. These shackles prevent side motion better than other types. 3) Bronze-bushed shackles use a bronze bushing inserted between the spring eye and bolt. It must be periodically lubricated or it will wear prematurely. Its chief advantage is cost, although it prevents side motion effectively.